By Glenn -- Okay...I am just going to come out and say it...water cooled transaxle Porsches are the next big thing. Long considered the black sheep of the family, recent market activity tells me these oft overlooked water pumpers are about to come into their own. Limited edition specimens like the RS & Club Sport variations are already heading for the stratosphere. 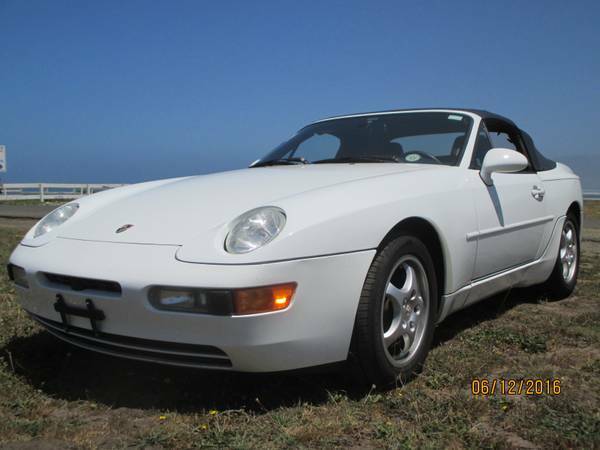 Find this 1994 Porsche 968 Cabriolet near San Francisco, CA for $18995 via craigslist. 968's were the pièce de résistance of Porsche's highly successful water cooled entry level product line before being replaced by the Boxster. Evolved over 20 years of 924/944/951 production run, the 968 incorporated all the technological advancements of the day in a totally redesigned platform. A significant difference was the move of production from Audi's Neckarsulm plant where 944's were assembled under contract, to Porsche's own Zuffenhausen plant. This gave Porsche total control over 968 production and warranted it as a true blood relative to its beefier elders. 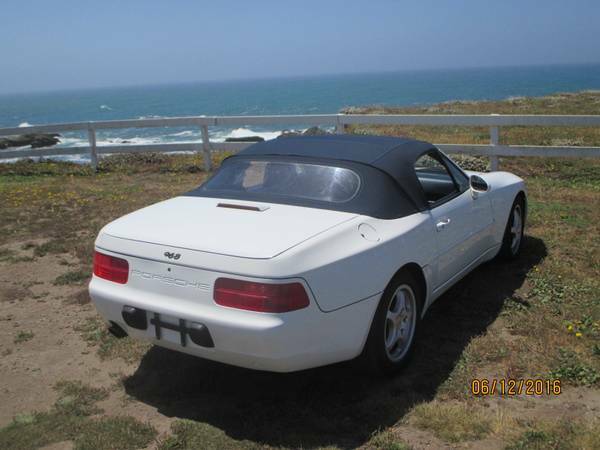 Porsche claimed a whopping 80% of 968 content was brand-new and not shared with the outgoing 944/951. 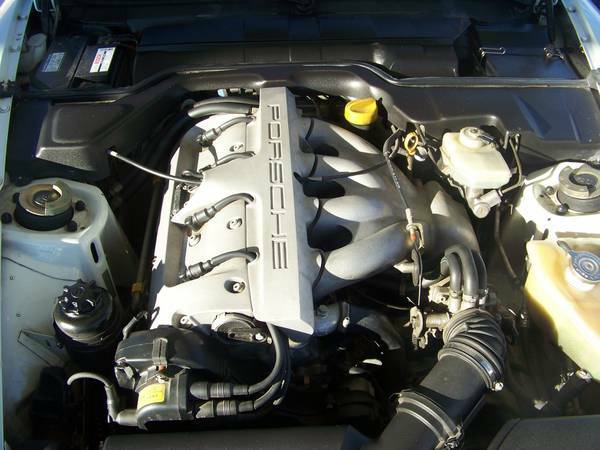 968's received an updated version of the 944 4-cylinder now punched out to 3.0 liters. Porsche's new VarioCam valve timing was incorporated as was newly tuned intake and exhaust systems to increase breathing. Along with refined electronic controls, these improvements pushed engine output up to 237 BHP which made for stout performance out of a 4-cylinder. This example is equipped with the less desirable Tiptronic auto stick but the low mileage and condition are a huge bonus. 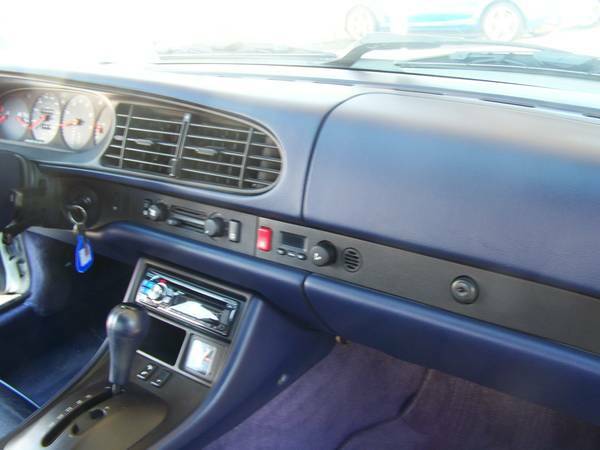 Color choices available during the 968 production run seemed nearly limitless. Car could be had in almost any jelly bean spectrum finish, and paint to sample was a popular choice as well. This example sports the classy Grand Prix White finish over Black/Cobalt Blue. Pictures supplied are not the best, but the interior looks well cared for and inline with the claimed 63K miles. 968's are revered for there near perfect 50/50 weight distribution and as such were a top car of choice for auto-crossing. This has left many examples well used and/or modified. 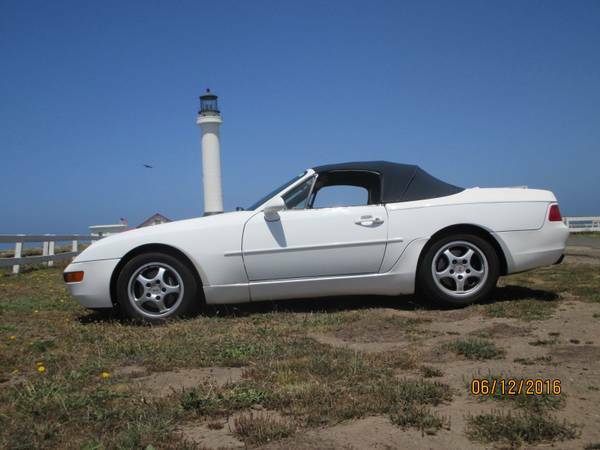 This example stays true to its stock form and in relatively nice low mileage condition. With only 1519 '94 model year 968's making it to North America, get your hands on a nice clean example, sit back, and enjoy the ride!